President Donald Trump speaks to media as he arrives on Capitol Hill in Washington on Wednesday. Beyond his cautiously optimistic comments, there was little other evidence of an end to the impasse over his demand for billions for a wall at the U.S.-Mexico border. He claimed he had “tremendous” support from Republicans, but GOP senators are publicly uneasy as the standoff ripples across the lives of Americans and interrupts the economy. Trump insisted at the White House “I didn’t want this fight.” But it was his sudden rejection of a bipartisan spending bill late last month that blindsided leaders in Congress, including Republican allies, now seeking a resolution to the shutdown over his signature campaign issue. Ahead of his visit to Capitol Hill and another round of talks later Wednesday at the White House, Trump made his comments about a possible resolution. But he also renewed his notice that he might declare a national emergency and try to authorize the wall on his own if Congress won’t approve the $5.7 billion he’s asking. There’s growing concern about the toll the shutdown is taking on everyday Americans, including disruptions in payments to farmers and trouble for home buyers who are seeking government-backed mortgage loans — “serious stuff,” according to Sen. John Thune, the No. 2 Senate Republican. Trump was to get a personal sense of the concern —and perhaps questions about his strategy — from those in his own party at the U.S. Capitol on Wednesday. Like other Republicans, Sen. Shelley Moore Capito of West Virginia said she wants border security. But she said there was “no way” the shutdown fight would drag on for years as Trump warned last week. Late in the day, Democratic and Republican congressional leaders were to return to the White House to meet with him and renew negotiations that have shown no apparent progress in the past week. Democrats said Wednesday they will ask Trump during the meeting to accept an earlier bipartisan bill that had money for border security but not the wall. House Speaker Nancy Pelosi warned that the effects of hundreds of thousands of lost paychecks would begin to ripple across the economy. “The president could end the Trump shutdown and re-open the government today, and he should,” Pelosi said. The White House was trying to shore up GOP support even before Trump spoke. At a private meeting with House Republicans, Vice President Mike Pence cited a C.S. Lewis quote calling courage a virtue, and he said Trump has no plans to retreat. “That pickup ain’t got reverse in it,” Pence said, according to people familiar with the conversation. But a growing number of Republicans are uncomfortable with the toll the partial shutdown is taking, and Trump’s response to it. 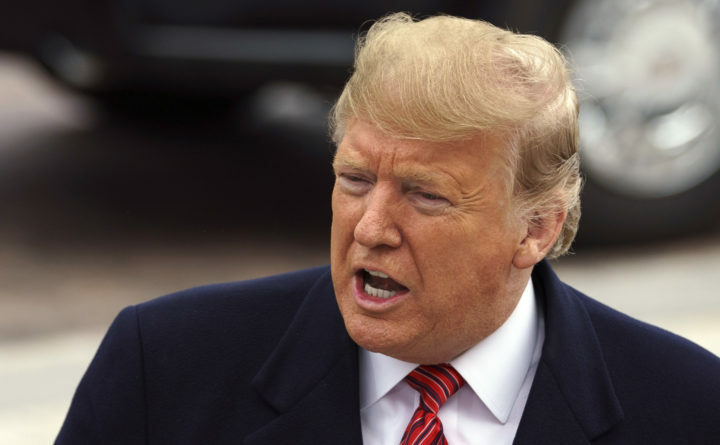 They are particularly concerned about the administration’s talk of possibly declaring a national emergency at the border, seeing that as an unprecedented claim on the right of Congress to allocate funding except in the most dire circumstances. Trump did not mention that idea Tuesday night. A person unauthorized to discuss the situation said additional “creative options” were being considered, including shifting money from other accounts or tapping other executive authorities for the wall. Trump addressed the nation as the shutdown stretched through its third week, with hundreds of thousands of federal workers going without pay. He claimed the standoff could be resolved in “45 minutes” if Democrats would just negotiate, but previous meetings have led to no agreement. For now, Trump sees this as winning politics. His re-election campaign sent out fundraising emails and text messages to supporters trying to raise money off his speech. Their goal: a half-million dollars in a day. In his dire address, Trump ticked off a string of statistics and claims to make his case that there is a crisis at the border, but a number of his statements were misleading, such as saying the new trade deal with Mexico would pay for the wall, or suggesting through gruesome examples that immigrants are more likely to commit crimes.